Advanced reservations have closed for this concert. Walk-up tickets will only be available in the event of any cancellations. Patrons who do not have reservations are encouraged to arrive one hour prior to the concert. If you have a reservation and will not be able to attend the concert, please call Allison at 210-302-6828 to release your tickets. 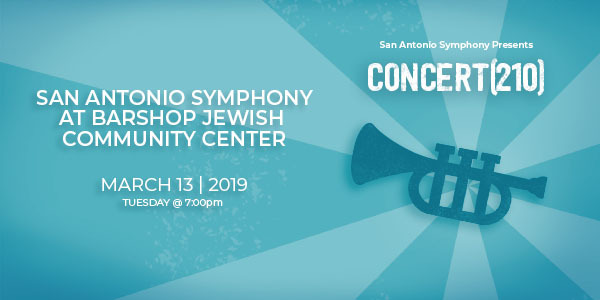 Concert(210) is designed to bring meaningful arts experiences into the community, celebrating shared culture and providing access to our broader audience who would not otherwise have the ability to immerse themselves in the arts. While the event is free, reservations are requested as space is limited. Barshop Jewish Community Center 12500 NW Military Hwy.